In the qualifying for the six-hour race in Bahrain – the season finale of the Sports Car World Endurance Championship WEC – Richard Lietz and Frédéric Makowiecki clocked the sixth fastest time in the strongly represented GTE-Pro class. Neel Jani and Nick Tandy have achieved the Porsche 919 Hybrid’s 20th pole position in what was the Le Mans Prototype’s last qualifying. 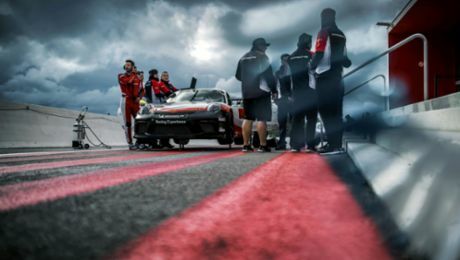 However, with a pursuit race at the wheel of their Porsche 911 RSR (#91), which Porsche Motorsport in Weissach developed from scratch for this season, the pair could still win the drivers’ classification on Saturday. 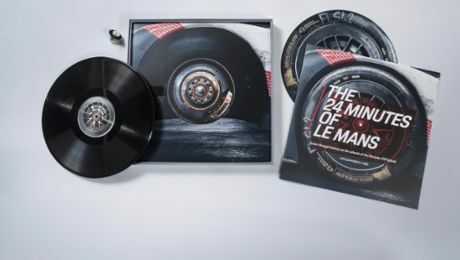 The safest way to take home the title is to win on the 5.407-kilometre Grand Prix circuit southwest of Manama, the capital of the Kingdom on the Persian Gulf. They can also claim the crown with second or third place, provided they finish in front of their title contenders from Ferrari and Ford. In the second (#92) 911 RSR fielded by the Porsche GT Team, Michael Christensen (Denmark) and Kévin Estre (France) occupied seventh place. Neel Jani (CH) and Nick Tandy (GB) have achieved the Porsche 919 Hybrid’s 20th pole position in what was the Le Mans Prototype’s last qualifying. Together with André Lotterer (DE), they will head into the final round of the 2017 FIA World Endurance Championship (WEC) on Saturday in Bahrain. 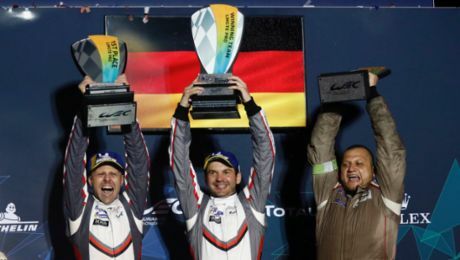 Earl Bamber (NZ), Timo Bernhard (DE) and Brendon Hartley (NZ) – the trio that was crowned as new driver world champions two weeks ago in Shanghai – qualified third for the Porsche 919 Hybrid’s farewell race. In the short 20 minute WEC qualifying session it is the average time of the two fastest laps of two drivers that counts. Jani/Tandy (1:39.383 minutes) and Bernhard/Hartley (1:40.011 minutes) were on duty at the Persian Gulf for the final qualifying. The overall fastest lap was achieved by Jani in 1:39.084 minutes. The 919 Hybrid’s impressive tally since its debut back in 2014 reads: 20 pole positions from 34 races with 13 front row lock-outs. Remarkably in the 2015 season when three manufacturers competed in LMP1, only the 919s made it on to the front row. In the third free practice session on Friday morning in Bahrain, Timo Bernhard topped the time sheets with a lap of 1:42.438 minutes when he was doing a qualifying simulation on used tyres. The sister car, in the hands of Neel Jani and Nick Tandy was second fastest. The respective third drivers of each car, Earl Bamber and André Lotterer, didn’t drive today. The six-hour race into the Arabian night will start at 16:00 hrs local time on Saturday. Stable ambient conditions of around 25 degrees Celsius are expected to continue. Neel Jani (33, Switzerland): "I thought to myself, this is the last ever qualifying session for the 919 Hybrid and I have to use everything I’ve learned over the past four years . . . and obviously this was successful. I’m mega happy that we got pole-position here. Nick’s lap in his second attempt was good too. I've taken quite a lot of poles with the 919, like the very first one together with Marc Lieb at Spa in 2014 and now the very last one. So far this part of the 919's story is full circle for me. But tomorrow we want to bring the last win home as well!" The official WEC App can be downloaded free of charge with an extended (not free of charge) version available which includes full live streaming and full timing. The live stream is voiced by the FIA WEC TV team including live interviews from the pits. The WEC races can be followed on various international TV channels in Europe, Asia, Australia and New Zealand, North and South America as well as in the Middle East and Africa. Here is the full TV distribution list. The nicest farewell wishes from Facebook, Instagram and Twitter that use the hashtag #919tribute will be published on the official Porsche homepage http://porsche.com/919tribute and in the LED strip light at the Porsche Museum in Zuffenhausen.